SAE shaft and bushings to fit 8 SAE pilot bearing sizes. Plated aligning cone with graduated 1 inch and 1-1/8 inch diameters for automatic fit to most clutch plates. Tapered cone for all others. W1158P shaft and bushings to fit 10 metric pilot bearing sizes. Plated aligning cone with graduated diameters for automatic fit to most clutch plates. Tapered cone for all others. Sizes SAE: .590, .612, .624, .668, .749, .786, .808 and .904 inch. SAE shaft and bushings to fit 8 SAE pilot bearing sizes. Plated aligning cone with graduated 1" and 1 1/8" diameters for "automatic" fit to most clutch plates. 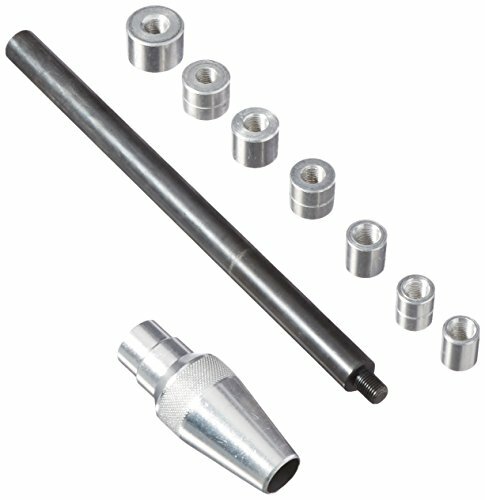 W1158P shaft & bushings to fit 10 metric pilot bearing sizes. Tapered cone for all others. Sizes SAE: .590, .612, .624, .668, .749, .786, .808 & .904"
Plated aligning cone with graduated diameters for "automatic" fit to most clutch plates.